Are you tired of having bad hair days? You know. Those days when you wake up and your hair is going in one million directions and standing on end. It looks frizzy and out of control and everything that you try to do to fix it only seems to make it worse. You just want to throw a baseball cap on your head and hide away from the world or cover it up with a wig. Fortunately, there are many ways that you can rise from that disgrace and bring back the lost glory of your hair. But what caused the frizz in the first place? Experts agree that there are many factors that lead to your hair’s condition i.e., over processing, environmental factors, damage, genes, nutrition, texture, etc. Regardless of the cause, you can manage your locks the best way possible. What do you need to do? It is highly recommended that you shampoo only up to four times a week. That is because going beyond that can lead to dryness, which will worsen the problem. You would not want to further aggravate the damage, right? It is also very important that you know the correct shampoo for your hair type. As you may know, some products are intended for fine hair, while others are for a wavy or thick kind. It is also recommended that you apply deep conditioner once per week, especially if the damage is caused by paring and coloring. Just make sure to rinse it off with cool water as it tightens the hair cuticles, making it shiny and sleek. This also gives the appearance that you hair is less frizzy than it really is. Do not use oil and cream treatments though as this keeps hair from absorbing more moisture that will help in keeping hair hydrated. While your hair is still damp, make it a point to apply anti-frizz serum. Doing so will seal the cuticles of your hair, reducing its roughness and dryness effectively. Is conditioner not enough then, you ask? With frizzy hair, you need all the help that you can get from any product that you can use. So, in addition to the serum, you should also spray on a leave-in conditioner. Not only will this help cut down the frizz throughout the day, it will add enough weight as well. 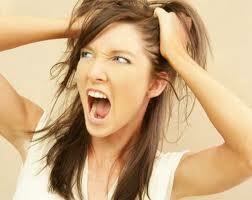 This means that you have to cut off the split ends every six weeks, as these can cause unhealthy hair. When all that is left are healthy and vibrant strands, you significantly reduce the frizz. Although the heat from the sun can also cause damage, nothing is more detrimental to your straight tresses or curly locks than blow dryers and flat irons. It is best that you opt to air dry instead. However, if you really need to use either tool, make sure to apply first a hair product that will provide protection from heat damage. When styling, you should also use protective serums for added smoothness. Following these tips will definitely help you deal with frizzy hair. Once it is back to its vibrant and shiny condition, you will be able to finally say that you have regained your crowning glory.